Aries is the first sign of the zod iac and coincides with the date of the beginning of the spring equinox. The sign is ruled by the planet Mars, which symbolises courage and self-assertion. Aries is associated with the First House, which is the most powerful house, that of the EGO and energy. 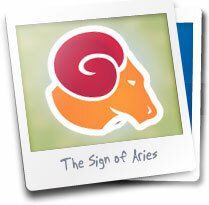 Learn about Aries baby's profile. The first decan begins on 21st March and ends on 1th April . It is ruled by Mars and those born during this decan are energetic and full of life! The second decan begins on 2th April and ends on 11th April. This decan is ruled by the Sun, which gives a person born during this decan great self-confidence and an excess of energy. The third decan begins on 12th April and ends on 20th April. This decan is ruled by Venus, who endows the individual with an artistic temperament. These individuals are passionate and less interested in everyday matters than experiencing sensations. Learn more about the Aries rising sign. Arieses are people with great self-confidence, candid, determined, courageous, passionate and impulsive. They are often idealistic and sometimes impetuous, with a dynamic personality which sometimes borders on obstinacy. Their energy makes them happier working under their own steam and they enjoy debate, even though they do not find it easy to accept when others disagree with them. Arieses therefore excel in the art of contradiction. In competition, they are �winners': they have few scruples, are risk-takers and are prepared to lie to win the argument. Arieses are indefatigable workers and possessed of a fiery temperament, with an unequalled and rapid grasp of detail. They are strong individuals and self-centred, not hesitating for a moment to play their entire hand to get results. They are redoubtable adversaries, enjoying challenges, gambles and success. They face up to life's experiences without concern for the dangers they might incur. Their energy enables them to bounce back and pick themselves up again in the face of adversity! They see life as an ongoing challenge where they need to succeed. They are a real driving force for others and genuine pioneers! They are also pragmatists, who are lively and like to be noticed. They are ready for anything, in love and at work, to charm others. This Fire sign has no scruples and does everything possible to succeed. They do not hesitate to compete in life, love and work. They have the courage to take the initiative, take over as leader and get to work. Nothing can stop them! They need continual changes and challenges to live up to their feisty nature and prove to themselves they exist! With their conquering spirit, Arieses are ideal lovers, being both impulsive and enthusiastic. They know how to use ingenious tactics, which will be just as good at winning over the marketplace as a loved-one. Arieses excel in negotiating and their talents as orators enable them to reach managerial posts with ease. Their winning and combative edge can quickly catapult them to the top of professions, preferably non-sedentary ones. Arieses are rarely malicious and are often bright individuals whom people notice quickly for their perseverance as much as their panache. Their playful outlook allows them to adapt quite happily and face the world with unrivalled vivacity. People can get tired of an Arieses's unpredictable and impulsive behaviour, so be careful! With a tendency to be influenced by Mars, Arieses fits of temper are feared by those around them. Like all passionate individuals, they quickly become irritable if people dare to challenge them or threaten their position. They soon tire of repetitive tasks and lack staying-power, if they are not allowed to express their creativity in all areas. This sign likes red because it is flamboyant like him/her, a deep colour which stands out. Red roses, the symbol of passionate love, are certainly their favourite flowers: like those born under this sign, red roses stand out from the rest in the garden. But watch out for the thorns! In the workplace, Arieses show all kinds of qualities: they are active, dynamic, reckless, tenacious and prepared to do anything to complete a task successfully. They have the advantage of a lively and effervescent mind and will flourish in management positions or positions of responsibility. They are driven by risk, being unable to stand routine, and pragmatic, determined and capable of lying to get their way. In action, they are courageous and pugnacious. Arieses frankness is very much appreciated and those around Arieses know they can count on them. Although they like being in this role as a �point of reference', Arieses prefer to have autonomy in their work. In fact team work often demands extra effort from them, as it goes against the grain for them. The female Arieses is looking for a genuine love-affair, a really passionate relationship: her partner will have to do everything possible to seduce her and respond to her whims! She is very often a person of great independence and completely together. The male Arieses is generally quite a dreamer. He likes to savour each experience to the full and above all, is searching for life's pleasures rather than an orderly life. He is also capable of being very charming and very� seductive! In love, Arieses behave like �conquerors'! They like to please and their passion leads them to make impulsive gestures which make them stand out from others. When in love, they are no less romantic. Their fiery temperament makes them ideal lovers. They enjoy surprising their partners with sexual games and therein lies their great charm. Anything rather than monotony. By instinct, Arieses are passionate sexually. Crushes are a very frequent feature of this fire sign. Arieses really enjoy transient flings, finding them terribly difficult to resist. They are indomitable and do not like to go unnoticed. They appreciate exoticism and are attracted by all kinds of novelty. Opposite sign of the zodiac/ polarity: Libra. My son's date of birth is 13 April 2009 .born at Nagpur , Maharashtra at 6.30am.kindly tell about his future life. Love horoscope for September 2016 for the sign of for Taurus Have a good day ! Born in the United States... Peoria, Illinois... St. Francis Hospital on March 27th, 1975! Aries through and through. I enjoyed reading your synopsis of an Aerian.Very true from my own self review.You are great! Thanks Dyiaram for your nice comment ! I have never been successful in my life born on ninth in the year sixty two right from childhood my life has been full of misery and struggle why?